Hello All! I know it's been a while since I posted. Some health issues have kept me out of my craft room. I'm finally feeling much better so hopefully I'll get back to crafting soon. #5 - How You Bean? Thanks for reading through my list. I'll be back soon with my favorite cards of 2017. Happy Wednesday!! It's time for a new challenge at Word Art Wednesday. This week our focus verse is from 1 Chronicles 16:34, "O give thanks unto the Lord; for he is good; for his mercy endureth for ever." We could camp out on the first half of this verse for a long time thinking about all the wonderful things the Lord has done for us. He has given us so much! Then when we get to the second part of this verse, "his mercy endureth for ever" we could spend another lengthy time span. When we think of the wrong we've done and the consequences we deserve and yet the Lord offers us salvation, we can't help but thank Him and praise Him. He deserves our praise, thanksgiving and adoration. For my card this week I chose to make a Thanksgiving card. One of the good things the Lord provides for us is people to love and encourage us. This card will go to one of these people the Lord has put in my life. 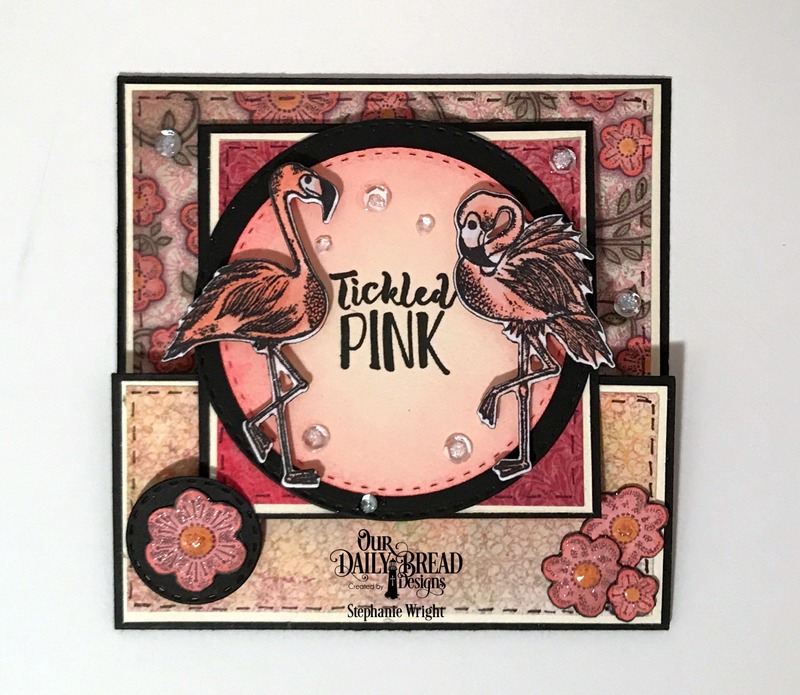 I started with a Half-Shutter Card base from Our Daily Bread Designs. Our daughter gave me three paper pads by Playing With Color 2 with fall colors and patterns. One of the pads was kraft cardstock with orange-gold foiling. Three of the patterns in the pack made their way onto this card as did strips of the solid orange-gold foiled sheet. These solid foil strips add a little extra interest to the sentiment panels. This card design gives several spots for sentiments and/or places to write a message. This card has the free digi WORDart on the front and a stamped and heat embossed sentiment on the inside. 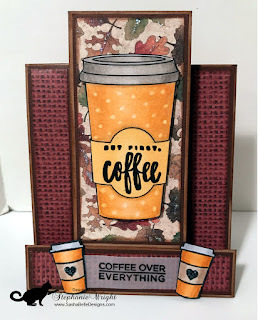 I used fine detail embossing powder from this week's sponsor, Simon Says Stamp for the heat embossing. I love the smooth finish this powder gives even when only using one layer of embossing powder. Somewhat hidden when the card is on display is a third panel where I'll write a short message to the recipient. An alternate choice of location for a message is on the back of the card. Since the finished size of this card is 4" x 5.5", the back provides plenty of space for a personal message. For cards that are meant to be displayed, I usually like to put my message in an "out of the way" spot. Thanks so much for visiting with me today. 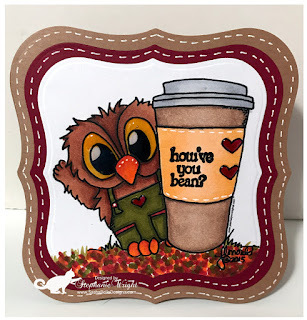 I hope you'll stop by the Word Art Wednesday blog to pick up your free digi and see the inspirational projects from the rest of the Design Team. Hello! Thanks for stopping by today. It's time for another challenge at Word Art Wednesday. When I saw our focus verse, I knew that it would be perfect for a Pastor Appreciation gift for my husband. 1 Timothy 1:12 says, "And I thank Christ Jesus our Lord, who hath enabled me, for that he counted me faithful, putting me in the ministry." After being in various music ministry positions for 13 years, the Lord called my husband, Tim, to be a pastor. That was over 20 years ago. I know beyond a shadow of a doubt that Tim would say that it is only because the Lord enables him day by day that he is able to care for the people in our church. Not that our people are difficult, they are not. Our church has a wonderful spirit of unity. It's because Tim feels such a great responsibility to lead them correctly and be a good example to them. He is a bi-vocational pastor so he has to do his studying, visiting, etc. outside of his 40 hour work week at a secular job. He sacrifices a lot of himself to spend time studying, praying, visiting, writing cards and notes and checking up on people via texts, emails and phone calls. I believe the Lord rewards Tim's faithfulness by continuing to give him the strength and wisdom to minister to our church family. Tim is very supportive of my crafting endeavors so I like to do extra special things for him when making a project for him. He likes my notebooks and uses them to write down prayer requests on Wednesday nights and in keeping track of various items at work (separate notebooks). I noticed that his prayer list notebook was looking a little worse for the wear so I made him a new one. This time I tried putting a coordinating patterned paper as a binding around the spine. Along the edge of this I used jute ribbon and twine for decoration. The sentiment panel was inked before being double matted and adhered to the front. I decorated the edge of the pocket with a strip of the patterned paper. Tim loves to fish so I wanted to use as much of this paper as possible. The interior was looking a little plain so a matted sentiment was also added above the pocket. Tim sends out LOTS of cards to our church family when they need encouragement. To use more of the patterned paper, I made him a set of four coordinating cards. Two have a "Thinking of You" sentiment and two have a "Thank You" sentiment. I used Sketch #218 from Operation Write Home for my card design. Here is a picture of the entire gift set. Thanks for visiting with me today. I hope you'll come back often. Please be sure to pick up the free digi WORDart at the Word Art Wednesday blog. While you're there, don't forget to see the rest of the Design Team's projects - you are sure to enjoy! Also, if you haven't already done so, why not send your pastor a note of encouragement and appreciation. He will greatly appreciate it! Hi! It's time for another Word Art Wednesday challenge. This week we're focusing on 1 Thessalonians 1:3, "Remembering without ceasing your work of faith, and labour of love, and patience of hope in our Lord Jesus Christ, in the sight of God and our Father." Paul is writing to the Apostle Paul and letting them know how much he appreciates them and that their efforts are not going unnoticed. So often in life today, there is so much negative talk. Whether it's on social media, in conversation or wherever, people feel like they can say whatever they want no matter how hateful or unkind. Paul demonstrates for us that we need to commend people when they do good things. We need to show appreciation and thank them for their efforts. Let them know we noticed and that we thank the Lord for them. October is Pastor Appreciation month here in the US. As most of you know, my husband is my pastor. I see first hand the "behind the scenes" work and effort he puts into caring for the congregation, preparing sermons, visiting, sending cards of encouragement, etc. I thought this card would make a great Pastor Appreciation card for him. Since he's so supportive of my crafty habit, I try to make his cards extra special. I decided to try a Pop Up Book Fold card. 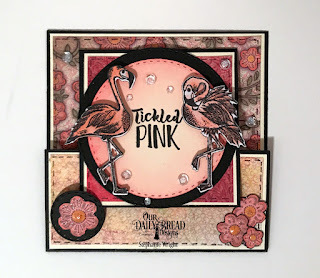 You can click the link to see a great tutorial video by Dawn Griffith. I thought the book fold was also appropriate since he uses so many books in his sermon preparations. This week's WORDart was printed on white cardstock and then the edges were distress inked before being mounted on a stitched die cut mat. 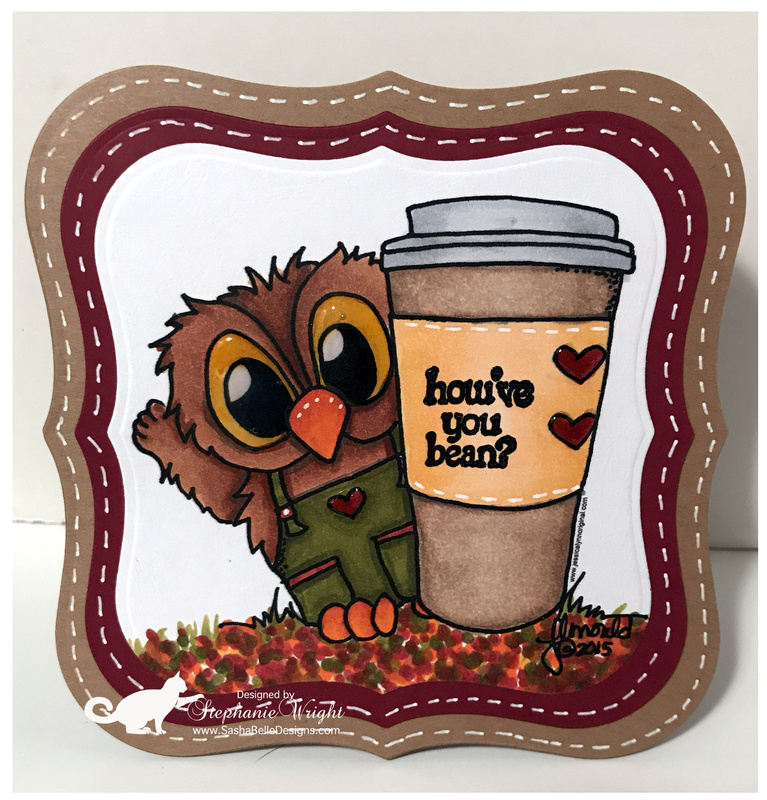 The "thankful for you" sentiment was heat embossed on a stitched oval die cut and layered over a stitched banner die cut. To make the patterned paper layer, I cut my patterned paper slightly smaller than the navy cardstock and temporarily adhered it to the navy cardstock while making the long cuts shown in the video. Then I removed the patterned paper. I made two vertical cuts to connect the two long cuts in order to remove the middle section. The edges were inked with Distress ink and then the patterned paper was permanently adhered to the navy cardstock. Then I proceeded to score and fold the cardstock as described in the video. I changed the measurements slightly because my navy cardstock is 5.25 x 8.25 and the patterned paper is 5 x 8. An encouraging quote by Corrie ten Boom was heat embossed on white cardstock. This week our sponsor is Simon Says Stamp. I used two of their embossing powders on today's card. I really like how their embossing powders show off all the fine details when embossing words and images. The edges of the sentiment panel were distress inked before being adhered to the left panel of the "book." Another piece of white cardstock was also distress inked and adhered to the right page of the "book." I'll write a short message on this panel. Recollections Spice Market Cardstock, 8.5" X 11"
Thanks for stopping by to visit with me today. 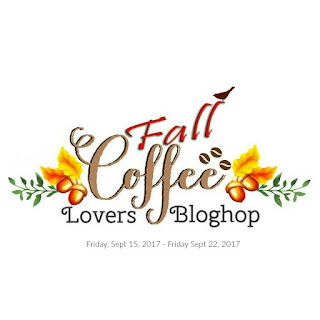 I always appreciate you taking time to stop by my blog. I do hope you'll come back soon. This is my last post as a Guest Designer for Our Daily Bread Designs. I'm so thankful for the opportunity Kelley and Lisa gave me to design for ODBD. I had the privilege of meeting them in person last month and they are such nice ladies. For my last project, I just had to use the Double Display Card die and Double Display Layers dies. These dies make this type of card so easy! 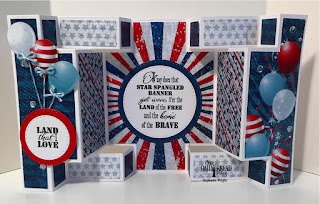 I used three of the papers in the Stars and Stripes Paper Pad for the card layers and one of these patterned and two solid papers for the circles surrounding the heat embossed sentiments. 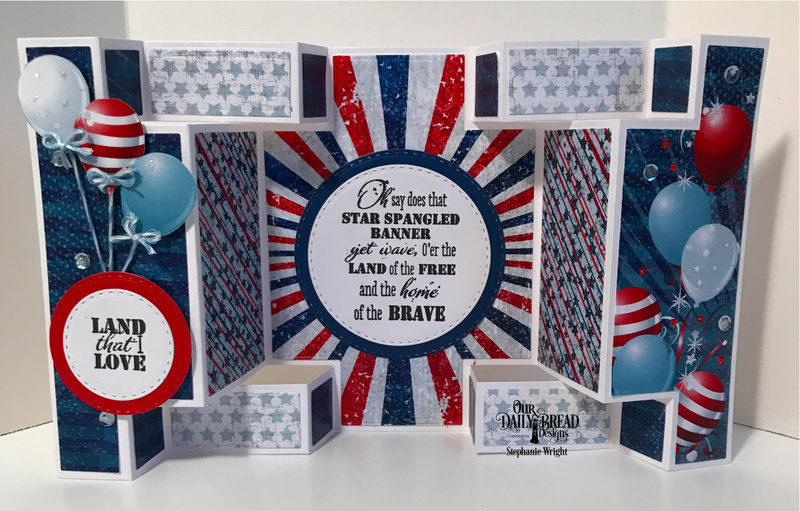 This paper pad has LOTS of beautiful patriotic patterns and coordinating solids. So far, I've made 3 Double Display cards and one A2 card and I still have quite a bit of paper left. I used several of the Double Stitched Circle Dies to showcase two of the sentiments in the Let Freedom Ring stamp set. I also used the Double Stitched Pennant Flags to set off these circles a little more. Stickles were applied to all the little light blue stars in the patterned paper and to the stars on the interior panel surroudning the sentiment. This adds LOTS of sparkle that I really wish showed up in pictures. Some sparkly enamel dots finish off the card. Thanks for visiting with me today. Please be sure to check out the entire ODBD September release here. Thanks again to Our Daily Bread Designs for having me as a Guest Designer. It was an honor and so much fun! Welcome back for another challenge at Word Art Wednesday. This week we're focusing on 1 Timothy 4:12, "Let no man despise thy youth; but be thou an example of the believers, in word, in conversation, in charity, in spirit, in faith, in purity." In this verse, the Apostle Paul was talking to his son in the faith, Timothy. He was encouraging Timothy to not let his youth get in the way of being an example to others. Paul knew and was reminding Timothy, that just because someone is young doesn't mean they can't be mature in the faith and used by God. God can use people of all ages to accomplish His work and to bring others to Him. I am frequently challenged by the way some young people I know live for the Lord and how they let His grace in their lives shine forth to others. For my card this week, I chose to make an easel card. I colored this little boy and his pumpkin with Copics and then die cut and matted this panel. I used square dies to make my photo corners. A baker's twine bow accents the border strip across the middle of the background panel. Some Nuvo Crystal Drops accept the little boy's buttons on his jacket. I also did some interior decorating on the greeting panel. Thanks for stopping by to visit today. 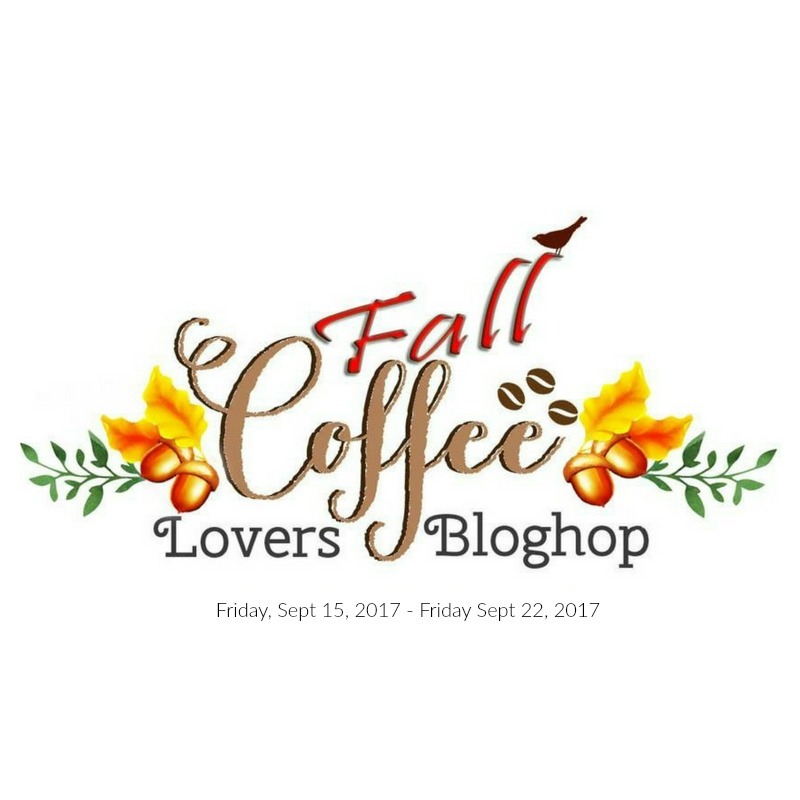 I hope you'll have a chance to visit the Word Art Wednesday blog for more inspiration and to pick up your free digi. Please come back later today for my last project as a Guest Designer for Our Daily Bread Designs. The Turtle Couple stamp set is one of my favorites from Dare 2B Artzy. In part, because my husband saw it first, liked it and told me that I really should get it. :) Who was I to argue? So, whenever I want to make a special card for him, I frequently turn to this set. I hadn't made him a card in a while, he's been working extra hard, and I figured he could use some encouragement. I colored the turtle with Copics and then fussy cut her out. (I own the coordinating dies but didn't want the white edge this time). I did a little inlay die-cutting at add the heart shape to the card front. The sentiment was heat embossed directly onto the heart die cut. I decided to add something a little special and made a circle card instead of the normal rectangle or square. Nuvo Crystal Drops add some dimension and shine to some of the design on the turtle's shell and to her toenails. A white gel pen adds faux stitching and some accents to the turtle. A small rhinestone accents the flower on the turtle.Sequins topped with rhinestones finish off the card front. Thanks for visiting with me today. I hope your week is off to a good start. This was a pretty quick card to put together and it used all scraps from other cards (except of course for the card base). Strips of patterned paper were layered with strips of navy cardstock from edge to edge on the A2 sized card front. The sentiment was white heat embossed and white gel pen adds faux stitching. The little coffee cups were colored with Copics and then fussy cut. A Tuxedo Black Memento marker was used on the cut edges and to darken up the hearts on the cup sleeves. A 1.25" square punch was used to punch 3 squares of kraft cardstock that was then dry embossed. These squares were matted on 1 3/8" squares of navy patterned paper and adhered to the card front. To finish off the card, the coffee cups were popped up using foam squares. I really like how this turned out and loved having a way to use up some of those scrap pieces of patterned paper. You'll probably see this sketch again. Thanks for visiting with me today. Please come back again soon.